Welcome to the ACTFL Proficiency Guidelines 2012 online. Here you will find the most current version of the ACTFL Proficiency Guidelines for Speaking, Writing, Listening, and Reading made interactive through the inclusion of glossed terms and multimedia exemplars. You can explore the Guidelines by skill or by level, listen to and read samples in English that represent abilities at each of the major proficiency levels. Download the complete text of the ACTFL Proficiency Guidelines 2012 document in a PDF format. Previous versions of the Guidelines are available here: 1986, 1999, 2001. Download the Guidelines Pyramid suitable for printing: 8.5 x 11 (PDF) or 11 x 17 (PDF). Purchase the Oral Proficiency Levels in the Workplace 24 x 36 poster or download it for printing (PDF). The ACTFL Proficiency Guidelines 2012 may be used for non-profit, educational purposes only, provided that they are reproduced in their entirety, with no alterations, and with credit to ACTFL. Any redistribution or reproduction of part or all of the examples in any form is prohibited other than for non-profit, educational purposes. You may not, except with ACTFL's express written permission, distribute or commercially exploit any media content. The ACTFL Proficiency Guidelines are a description of what individuals can do with language in terms of speaking, writing, listening, and reading in real-world situations in a spontaneous and non-rehearsed context. For each skill, these guidelines identify five major levels of proficiency: Distinguished, Superior, Advanced, Intermediate, and Novice. The major levels Advanced, Intermediate, and Novice are subdivided into High, Mid, and Low sublevels. The levels of the ACTFL Guidelines describe the continuum of proficiency from that of the highly articulate, well-educated language user to a level of little or no functional ability. These Guidelines present the levels of proficiency as ranges, and describe what an individual can and cannot do with language at each level, regardless of where, when, or how the language was acquired. Together these levels form a hierarchy in which each level subsumes all lower levels. The Guidelines are not based on any particular theory, pedagogical method, or educational curriculum. They neither describe how an individual learns a language nor prescribe how an individual should learn a language, and they should not be used for such purposes. They are an instrument for the evaluation of functional language ability. The ACTFL Proficiency Guidelines were first published in 1986 as an adaptation for the academic community of the U.S. Government’s Interagency Language Roundtable (ILR) Skill Level Descriptions. This third edition marks the third edition of the ACTFL Proficiency Guidelines includes the first revisions of Listening and Reading since their original publication in 1986, and a second revision of the ACTFL Speaking and Writing Guidelines, which were revised to reflect real-world assessment needs in 1999 and 2001 respectively. 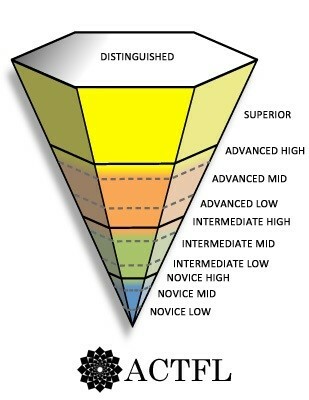 New for the 2012 edition are the addition of the major level of Distinguished to the Speaking and Writing Guidelines, the division of the Advanced level into the three sublevels of High, Mid, and Low for the Listening and Reading Guidelines and the addition of general level description at the Advanced, Intermediate, and Novice levels for all skills. Another new feature of the 2012 Guidelines is their publication online, supported with glossed terminology and annotated, multimedia samples of performance at each level for Speaking and Writing, and examples of oral and written texts and tasks associated with each level for Reading and Listening. The direct application of the ACTFL Proficiency Guidelines is for the evaluation of functional language ability. The Guidelines are intended to be used for global assessment in academic and workplace settings. However, the Guidelines do have instructional implications. The ACTFL Proficiency Guidelines underlie the development of the ACTFL Performance Guidelines for K-12 Learners (1998) and are used in conjunction with the National Standards for Foreign Language Learning (1996, 1998, 2006) to describe how well students meet content standards. For the past 25 years, the ACTFL Guidelines have had an increasingly profound impact on foreign language teaching and learning in the United States.